Don't order very old wines unless you know that the restaurant has a place or system suitable for laying wine down. Good wine brands are synonymous with quality. 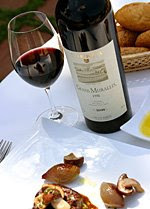 Choose restaurants that have renowned brands on their wine lists. A list with a lot of choice may be a discovery or a way to dissimulate high prices as the consumer has nothing to compare them with. Fortunately this practice is increasingly rare as consumers are becoming more familiar with wines and don't succumb so easily to such ploys. The D.O. (Denominación de Origen or appellation) provides you with a location but does not guarantee homogeneity between producers, as different styles do exist. If there are brands within the D.O. that can be trusted and you don't want to take risks, order them. Ask the restaurant to cool red wines in summer, as the ambient temperature will be too high. It's easy to lower the temperature from around 25ºC to 18ºC by just preparing an ice bucket with around 8 ice cubes in it. It's advisable for you to serve the wine yourself during the lunch or dinner if there is no wine waiter on hand. If you're having a white or rosé, it's better to pour out small quantities of wine so that it doesn't get too warm in the glass. If you don't finish a bottle, ask to take it home. Ask for just a glass: it's increasingly more usual to be offered wine by the glass. To learn more about the world of wine, consult Club Torres Online.